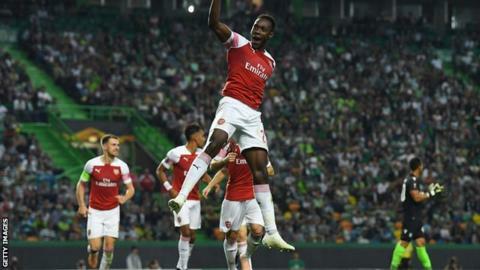 Danny Welbeck's late winner gave Arsenal victory over Sporting Lisbon in Portugal, as they retained their place at the top of Europa League Group E.
The striker pounced onto a mistake from Sebastian Coates and slotted it through the keeper's legs after 77 minutes. Nani had Sporting's best chance with a high curling effort after half an hour before Arsenal winger Henrikh Mkhitaryan's free-kick was punched comfortably away by keeper Renan Ribeiro. Those chances seemed to spark a bit of life into Arsenal and shortly afterwards Matteo Guendouzi's cutback found Welbeck, only for his close-range shot to be deflected out for a corner. Lucas Torreira's set-piece was palmed dangerously away before Welbeck eventually broke the deadlock with a cool finish in-between the keeper's legs. On the whole, the hosts showed little attacking intent - Sporting choosing to defend deep and counter-attack in rare spells. Full-back Marcos Acuna caused a few problems in the first half - beating stand-in right-back Stephan Lichtsteiner to drive along the baseline and earning corners with his aerial threat in the middle. Match ends, Sporting CP 0, Arsenal 1. Second Half ends, Sporting CP 0, Arsenal 1. Rodrigo Battaglia (Sporting CP) is shown the yellow card. Corner, Sporting CP. Conceded by Rob Holding. Radosav Petrovic (Sporting CP) wins a free kick in the attacking half. Corner, Arsenal. Conceded by Bruno Gaspar. Attempt missed. Jovane Cabral (Sporting CP) right footed shot from outside the box is high and wide to the right. Assisted by Rodrigo Battaglia. Corner, Arsenal. Conceded by André Pinto. Substitution, Arsenal. Alex Iwobi replaces Pierre-Emerick Aubameyang. Attempt missed. Jovane Cabral (Sporting CP) right footed shot from outside the box misses to the left. Assisted by Fredy Montero. Foul by Fredy Montero (Sporting CP). Attempt missed. Bruno Gaspar (Sporting CP) right footed shot from outside the box is too high. Assisted by Bruno Fernandes following a corner. Corner, Sporting CP. Conceded by Stephan Lichtsteiner. Attempt blocked. Jovane Cabral (Sporting CP) left footed shot from the left side of the box is blocked. Assisted by Bruno Fernandes. Substitution, Arsenal. Alexandre Lacazette replaces Danny Welbeck. Attempt blocked. Nani (Sporting CP) left footed shot from outside the box is blocked. Assisted by Jovane Cabral. Attempt blocked. Radosav Petrovic (Sporting CP) header from the left side of the box is blocked. Assisted by Nani with a cross. Attempt blocked. Fredy Montero (Sporting CP) right footed shot from the right side of the box is blocked. Assisted by Rodrigo Battaglia with a headed pass. Goal! Sporting CP 0, Arsenal 1. Danny Welbeck (Arsenal) right footed shot from the centre of the box to the centre of the goal. Delay in match Marcos Acuña (Sporting CP) because of an injury. Delay in match Renan Ribeiro (Sporting CP) because of an injury. Corner, Arsenal. Conceded by Radosav Petrovic. Attempt blocked. Stephan Lichtsteiner (Arsenal) right footed shot from outside the box is blocked. Attempt saved. Lucas Torreira (Arsenal) right footed shot from outside the box is saved in the bottom left corner. Substitution, Sporting CP. Jovane Cabral replaces Nemanja Gudelj. Sebastián Coates (Sporting CP) is shown the yellow card for a bad foul.